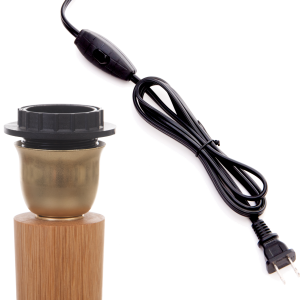 Whenever we see and order come in from the USA or Canada we ensure that each lamp is electrically wired to work in your country. In short this means we use an E26 edison screw bulb fitting and a black 2 pin US plug with the switch on the flex. When ordering you will be given a dropdown box to choose your lamp configuration, the main thing to consider is that lamp shades made in the USA attach to the lamp differently to those in Europe, for more information click here. 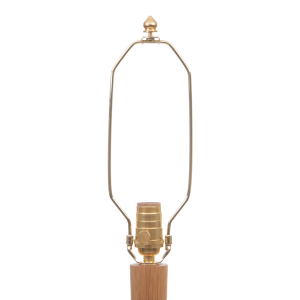 Brass covered E26 lampholder and black 2 pin plug with switch on the flex, it is advised to use this option with a shade to avoid having to buy extra fittings. 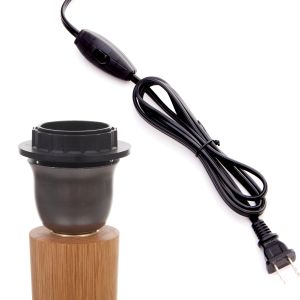 Nickel covered E26 lampholder and black 2 pin plug with switch on the flex, it is advised to use this option with a shade to avoid having to buy extra fittings. Lamp base only. If you are planning on buying shades locally you will need this option. The E26 3-way switch allows for different light levels and the harp accepts an American shade. Please note that you will need to order a harp that is the same height as your shade.